It’s hotter than blazes outside, so what better way treat yourself than with a cocktail and a tasty starter. Check out these Peach Daiquiris with Grilled Corn, Jalepeno & Queso Fresco Cheese Spread from Foodie for Two! Two highly anticipated crops are finally available from the local Colorado farmers – sweet corn on the cob from Olathe and juicy, super sweet peaches from Palisade. Sure, you can enjoy both the traditional way – the corn grilled or boiled and slathered with butter, and the peach halved and eaten over the sink so the sun-ripened, sweet juices can run down your chin. But my quest here was to create something different that still made your taste buds zing. 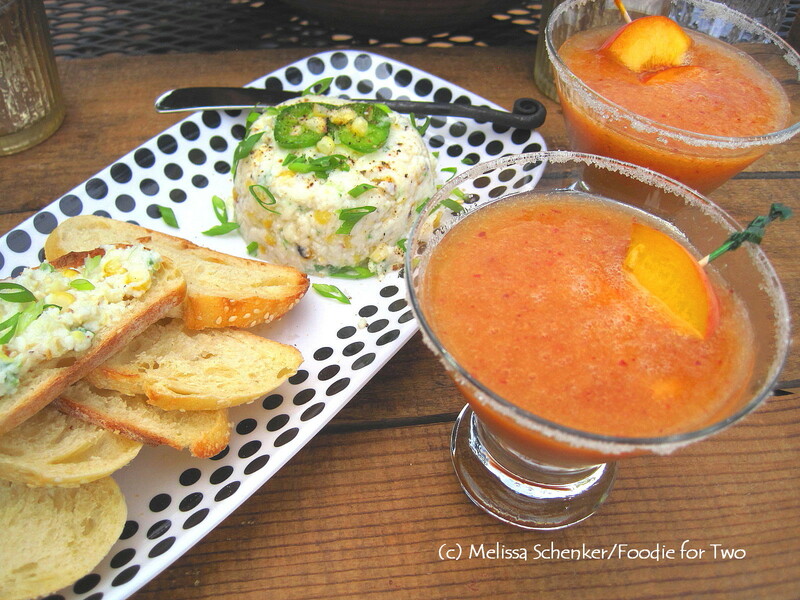 How about some Peach Daiquiris to enjoy with a delicious Corn, Jalapeno & Queso Fresco Cheese spread? The Daiquiri is super simple to make with the usual suspects: ice, fruit, sugar and rum – I like the flavor of dark rum but light works just as well. And the cheese spread offers up something refreshing and different with grilled fresh corn, buttery queso fresco cheese and spicy jalapeño. Ooh! Yummy looking! I’d pair these with some ‘Gypsy Kings’ and make it not only taste like summer, but also sound like summer! Great pairing – I love Gyspy Kings! In fact, I need to add them to my Pandora line up! Two songs come to mind – both by Van Morrison…The first is Brown Eyed Girl: http://www.youtube.com/watch?v=Q3TEkvxTIRk. When I sing it I change it to: Green Eyed Girl – ‘cuz both you and I have green eyes of course! The other is Bright Side of the Road http://www.youtube.com/watch?v=rCDZzf4ragg. Let me know what you think!